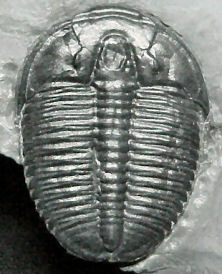 This evolutionary trend towards a shape called olenimorph comes from the type fossil of Ptychopariida Suborder Olenina which have thin exoskeleton, increased numbers of thoracic segments, and a widened, flat body. 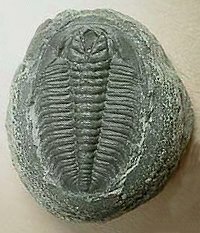 Since we study using Sam's web pages the evolution of trilobites in the Cambrian period (and later) our question is naturally Why a trilobite has these attributes? And then we explain that the subspecies has evolved these features exactly for this reason. So Sam tells us that paleobiologists suggest that the Olenimorph have adapted to a specific environment and the "form is associated with benthic habitats marked by low oxygen and high sulphur compound concentrations"
What has this form to do with that environment? "Fortey suggests that olenimorphs may represent the first symbiotic relationships with sulphur-eating bacteria as a feeding strategy. The numerous transverse thoracic pleurae presumeably overlaid a series of laterally extended gill exites, maximizing oxygen absorption and providing a large surface area upon (or within) which symbiotic bacteria could live." That is - sorry my French - bloody smart from little Ptychopariida! I would say, that is a divinely smart plan to get more food! No wonder they flourished all the way from Cambrian to the end of Permian.